Every year, Newsweek comes out with their list ranking high schools across the nation. This year, Seaholm ranked #484 and Groves ranked #222 out of 500 total schools on the list released August 19. Newsweek released two lists in regards to high school rankings in 2015. One of the lists, the one they call their “absolute” list, only ranks schools that perform at or above the 70th percentile for their state, according to Newsweek. Their second list, “Beating the Odds”, takes into account socioeconomic standing and the school’s ability to overcome it. The list being discussed in the this article is the former. These rankings contradict with lists that have come out before it, which have consistently ranked Seaholm above Groves. US News and World Report’s list ranking high schools in Michigan (public, charter, and magnet) ranked Seaholm in the #5 slot, while Groves was assigned #22. Additionally, Niche K12’s list, which only took into account other public schools, put Seaholm at #4 and Groves at #8. One possible reason for the difference in rankings in regards to Newsweek was because the publication mixed up some data that Principal Rachel Guinn sent in, according to Guinn. “When the rankings came out, I immediately knew that something was wrong,” Guinn said. Guinn then tracked down the person who published the Newsweek article and spoke to them on the phone. 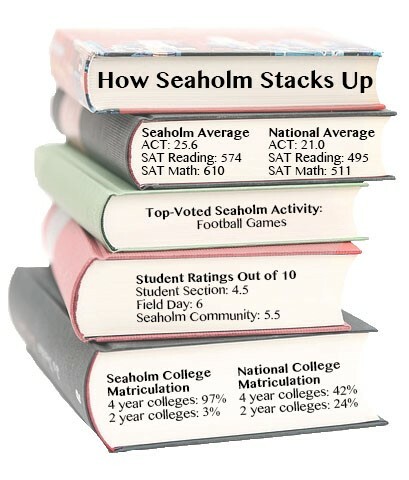 The journalist said that the reason for Seaholm’s low ranking was the school’s low college readiness numbers, which she claimed to have in her records as blank, but seemed to show in the rankings as “0”. Guinn then asked the journalist to rectify the report, because Seaholm has many college bound students, but Guinn did not get the answer she had hoped for. “[She told me] Newsweek never corrects after the article is published,” Guinn said. Newsweek will never correct the ranking that it gave Seaholm this year, so Seaholm’s ranking is not accurate. Regardless, there was a gap in rankings between the schools no matter what list was looked at. Seaholm and Groves have essentially the same curriculum, with the only differences being from teacher to teacher and not school to school, both Guinn and Superintendent of BPS Dr. Daniel Nerad confirmed. Due to this fact, many are still puzzled as to why there is such a large discrepancy between the rankings of the schools. Nerad said that one of the main goals for the schools is to make sure young people are, “future ready,” and he believes that both schools do a very good job at that. However, he warns people to perhaps take the fact numbers of the rankings with a grain of salt. The Superintendent wanted to reiterate that while there may be some differences in the actual rankings of the schools, just the fact that both schools are consistently ranked on these lists is a testament to the quality of the schools. He adds that these rankings don’t take into account extracurriculars, co-curriculars, and other actives which allow students to grow and learn in a different way than in the classroom, which is also a very important aspect of a school. If young people find that their school is not only a place that offers great academics but is a place they want to be, Nerad says that those are the things that matter more in the long run. He urges everyone to keep these rankings in context. Both Nerad and Guinn agree that there is far more to a school than just the raw numbers.